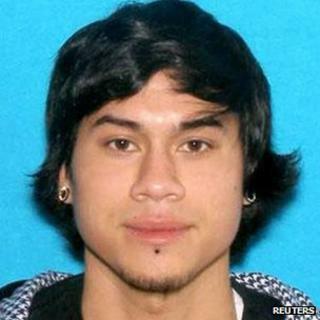 Police have identified the gunman who killed two people and injured one during a shooting at a shopping mall near Portland, Oregon. Jacob Tyler Roberts, 22, armed himself with an AR-15 semiautomatic rifle, which jammed during the shooting. Roberts, who used a stolen rifle and wore a mask, killed himself after firing randomly around the mall. Clackamas police said they had no motive, and named the dead as Steve Forsyth, 44, and Cindy Ann Yuille, 54. The third victim, Kristina Shevchenko, remains in a serious condition at a Portland hospital. "It really was a killing of total strangers, to my knowledge at this point and time. He was really trying to kill as many people as possible," Clackamas County Sheriff Craig Roberts told ABC's Good Morning America. The gunman apparently targeted "anyone who was in his line of sight", Sheriff Roberts told NBC's Today show. "It was very apparent that he had a mission set forth to really take the lives of people in that mall," he added. Roberts rented a basement room in a Portland home and had not lived there long, according to a neighbour, Bobbi Bates. Ms Bates said she saw Roberts leave at 13:30 PST (21:30 GMT) on Tuesday wearing a dark jacket and jeans and carrying a guitar case. The shooting began about two hours later in Clackamas, a suburban town on the southern fringe of Portland, in the middle of the Christmas shopping season. Roberts parked his 1996 green Volkswagen Jetta in front of the second-floor entrance to Macy's department store and walked briskly through the store, into the mall and began firing randomly, police said. Witnesses said he fired several times while on the second floor of the shopping centre, near the food court and Macy's. Some of those present said he called out: "I am the shooter." Roberts used a stolen rifle from someone he knew, officials said on Wednesday. It jammed during the attack, but he managed to get it working again. After the shooting was over, police combed the premises telling shoppers and staff cowering in toilets and hiding places that it was safe to emerge. Taylor Gibson, an employee at Build-a-Bear, said when she first heard the shots, she and others rushed customers to the back room and closed the store's front gate. "That gate takes 30 to 45 seconds to close," she told the Oregonian. "Honestly, as I was shutting that gate I was waiting for that person to walk up the hallway and shoot me." Evan Walters, who worked at the mall and was locked inside a store, told local broadcaster KATU he saw two people who had been killed. He and other store employees placed sheets over the bodies. The shopping centre Santa, Brance Wilson, told the Associated Press news agency how he dived for cover as gunfire rang out. "I heard two shots and got out of the chair," said Mr Wilson, 68. "I thought a red suit was a pretty good target."